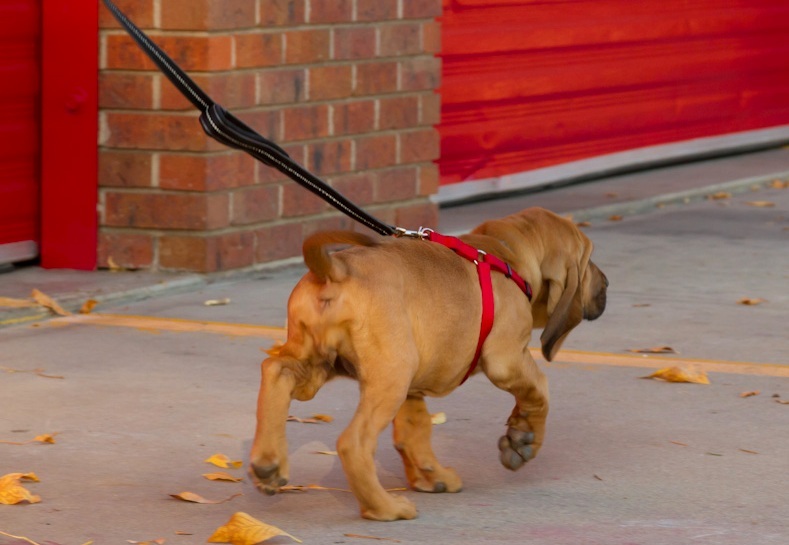 We Love The Bloodhound Puppies! Here is a place for you to keep up with all of the latest news, information, and pictures of our pups and our family. We are so happy that our pups are doing what they are bred for...a job in Search and Rescue. It's been a while since my last post and a lot of activities have transpired since then. We have had a very emotional year, especially the last quarter of 2011. Some of the latest and greatest news is we now have 10...yup, 10 pups out in the field of Search and Rescue...7 of them are right here in Colorado. We are just as happy and proud as the new owners. So Elvis really didn't end up being so much of an Elvis, so he's a Riley. Just wanted to let you know how his first training session went. In the dark in a place he's never been, in a harness he'd never worn, he tracked two different people in two different locations without watching where they went off to with perfect precision and no direction from me. It was amazing! The two handlers I was with were amazed. One of them commented the puppy already tracked better then his working Malinois. I wish now I'd taken video because it was simply amazing. The runner would drop a treat a few yards out before completing their 50 yard dash and every time Riley got to the treat his air breaks came on and he went to the exact spot. I just can't tell you how delighted I am and how amazed. Part of it is his breed I'm sure, but in my experience with police dogs it has a lot more to do with breeding then breed, so serious kudos to you for a job well done! I'll continue working him on my own till January due to my schedule not allowing me to train with Al till then. After that, I'm hoping to take him on patrol in May and I'm hoping he'll be fully active and certified at 12 months. I'll keep you posted with updates! I'm going to try and have our town paper do an article on him at the least and I'd really like to see if the Newspaper would do a story on him. We'll see! We love hearing from all of the owners and we will be sharing more as time goes on. Here is a pic of one of the pups hard at work (training) with a handler that works at a Fire Dept. here in Colorado. I just wanted to say hello, and wish you and your family a Merry Christmas and a healthy, happy New Year. Both Al, and Brian's bloodhounds are great trackers it has been fun to have the puppies at training. Both hounds are growing like weeds, and are such beautiful girls. I will be ready for a puppy in the spring. I am getting excited to start training a new puppy. My wife and I both prefer a male K-9, and look forward to coming to visit your kennels when you have your next litter. If you would like to get on our waiting list for a pup in one of our upcoming litters, contact us for more details. We raise our Bloodhounds for Search and Rescue so the missing can be found. Our goal is to provide a service to the people of communities everywhere a working dog is needed. Raising Bloodhounds has always been a passion. I love animals and they love me. Ever since I was a child I have had just about any animal you can think of as a pet from raccoons, to skunks, to goats and even chickens. They all have played a very special part in my life as I did theirs. I have been training and showing dogs now off and on for almost thirty years and now have the chance to enjoy one of the best breeds on the planet...the Bloodhound.